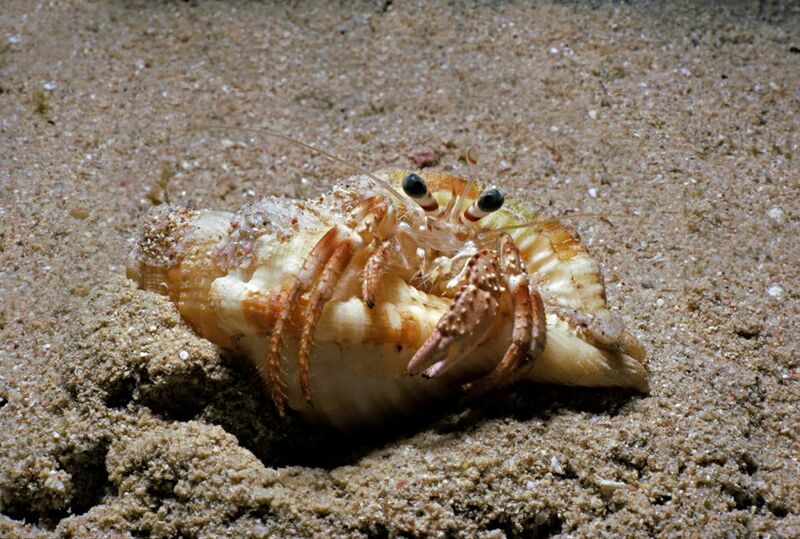 On occasion, hermit crabs lose their legs (including their claws), but they often grow back during subsequent molts—the process of shedding its exoskeleton as it grows larger. Loss of legs may be a consequence of stress caused by various factors, including tank conditions, fighting, and mites. For the sake of your hermit crab's health, it's important to look into these issues and correct anything that may be wrong in its environment. Why Do Hermit Crabs Lose Their Legs? If you have a hermit crab that's losing its legs, check for problems with your crab before assuming its legs will grow back. Although losing a limb isn't a death sentence for a hermit crab, it's typically an indication of a problem that needs immediate attention. At the first sign of leg loss, look for problems that commonly cause difficulties for these animals. The first place to look is in your hermit crab's home as poor tank conditions are a common cause of leg loss. For these animals to survive in captivity, it's vital that you provide them with ideal conditions. Mites may be small, but they can wreak havoc in a hermit crab tank, even leading to loss of limbs. Hermit crabs are usually pretty peaceful, but sometimes they fight over resources. This is especially true when it comes to the most coveted shells or when a tank is too small for the number of crabs it houses. The fights can get pretty nasty and often result in the loss of a limb for one or more of the crabs involved. Stress and illness may cause multiple legs to fall off. Though hermit crabs are best kept with at least one or two other crabs, an overcrowded tank can be stressful or spread disease to all of its inhabitants. During molting, moving or disturbing the crab can cause extra stress that may also lead to leg loss. Sometimes a new crab loses a leg shortly after you get it home. This is more likely because of conditions your pet experienced during collection, shipping, and its time at the pet store rather than anything you're doing or not doing. Check the tank and crabs for mites, which appear as tiny moving specks, and make this a regular habit. Hold your crab up by the shell until it extends outside of it (blow gently on the crab to entice it out if necessary) and inspect its body as well. If a newly acquired crab lost its leg due to stress, make sure the tank conditions are optimal and don't rush handling it. The stress reaction can be reversed now that your crab is being properly cared for. Many veterinarians, especially those who specialize in exotic animals, are willing to examine invertebrates like hermit crabs. A trip to the vet may be helpful in diagnosing a leg loss problem. If your hermit crab has lost more than one leg in a short period of time, isolate it from the other crabs. Continue to maintain proper conditions, especially the temperature and humidity. The cause of leg loss is usually not contagious, but this will help keep your crab comfortable and free from the stress of competing with other crabs. Unfortunately, crabs that drop multiple legs are often so stressed that they cannot be saved. There are a number of steps you can take to prevent your hermit crabs from losing their legs in the future. Double-check all of the tank's environmental conditions regularly. Be diligent about maintaining ideal conditions to keep your hermit crabs as healthy and happy as possible. Under proper care, hermit crabs can live for a surprisingly long time, some even reaching 30 years old and beyond. Generally, two or three small hermit crabs can live comfortably in a 20-gallon tank. You will need a larger tank—about 40 gallons— if you have several crabs or full-grown crabs. Maintain the tank at 75 percent to 85 percent relative humidity. If the environment is too warm, it may also be too dry for a hermit crab. Purchase a hygrometer so you can easily and accurately monitor the humidity. Check the temperature in your crab's enclosure. Make sure it isn't too high or too low, doesn't have hot spots, and doesn't fluctuate too much between day and night. Aim for temperatures between 72 F and 78 F.
Feed your hermit crabs daily and offer a varied diet. Proteins like shrimp, krill, and bloodworms or mealworms and the occasional unseasoned meat or chicken treat—raw or cooked—are a good foundation. Fruits and vegetables that have been washed with dechlorinated water are good as well. Many hermit crabs enjoy apples, bananas, blueberries, broccoli, carrots, corn, grapes, mango, and spinach. Avoid commercial pellets and any foods with preservatives or salts. Provide two bowls of water for your crabs. One should be fresh water that has a dechlorinator to make sure it's free of chlorine. You can buy it at any pet store that carries fish supplies. The other bowl should be saltwater created using the same aquarium salt used for keeping marine fish. Do not use other forms like table salt or Epsom salts as these will harm your crabs. Be careful with residual chemicals from cleaning in or around the tank. A thorough cleaning, including removing the substrate, should be done once a month. Try to use only hot water when you're cleaning the tank. Clean the tank daily to remove any waste matter and uneaten food before the crabs have a chance to bury it. Every two weeks, boil all of the shells for a deep cleaning to prevent mold and remove any debris. Check the condition of your pet's substrate. Small-grain or coral rock sand and gravel are good choices; fine coconut fiber helps during molting. Ensure the depth is at least three to five times the height of your largest crab so they can burrow properly. The substrate should also be damp but not saturated and you want to ensure that it contains no mold. You can also use reptile moss to help control moisture in the enclosure's hides, but this must be changed weekly. When a crab is molting, it's best left alone. This can take several weeks, so be patient to avoid adding undue stress. You can protect a molting crab from its tank mates using the bottom portion of a 2-liter bottle. If you're concerned that it may have died while molting, a foul odor will indicate that within a couple days. Don't bathe your hermit crab too often as this can be a stressful experience. Under most conditions, once a week is plenty if you maintain proper humidity levels and provide good water sources. If you think your crabs and tank may be infested with mites, remove the crabs, sterilize everything else in the tank in boiling water, and wipe the tank with vinegar. Avoid pesticides or mite treatments as these are toxic to hermit crabs. Bathe your crabs with Stress Coat (available in the aquarium department of pet stores) until you no longer see mites. If your crabs are fighting over shells, increase the number of appropriately sized shells in a variety of styles. Offering a greater selection will typically stop the fighting. Consider providing a larger tank, more hiding places, and more food and water bowls when you're dealing with fighting crabs as well. If the problem persists, you might want to separate the crabs, pairing at least two crabs who get along in each tank.